66 yachts from the J Boat range made up the highly competitive fleet for the Landsail Tyres J-Cup in partnership with B&G. This was the 17th edition of the J-Cup and four one design fleets were racing for their UK National Championships. 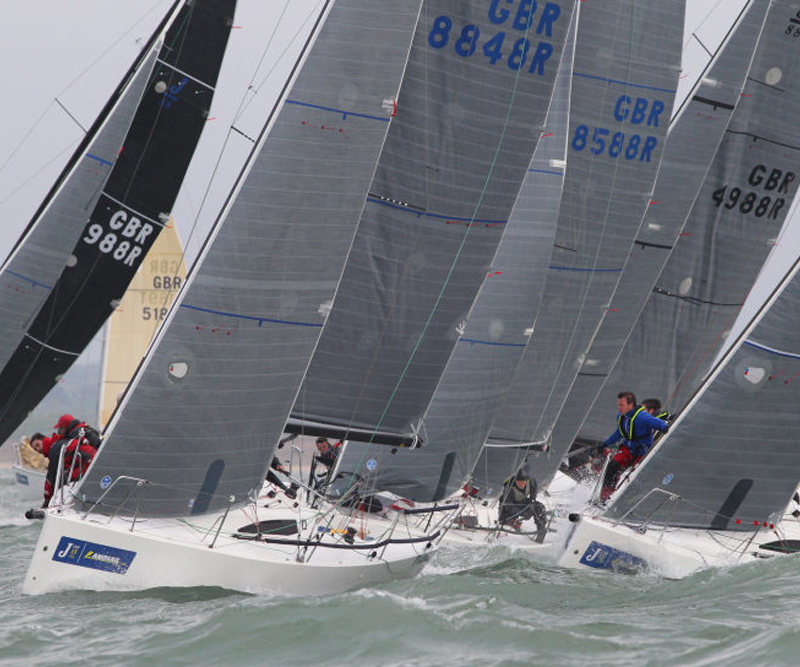 Of the 34 yachts vying for UK Championship honours, an incredible 23 of them made the podium. The racing right across the fleet was incredibly close, with seconds deciding winners over the three day regatta. 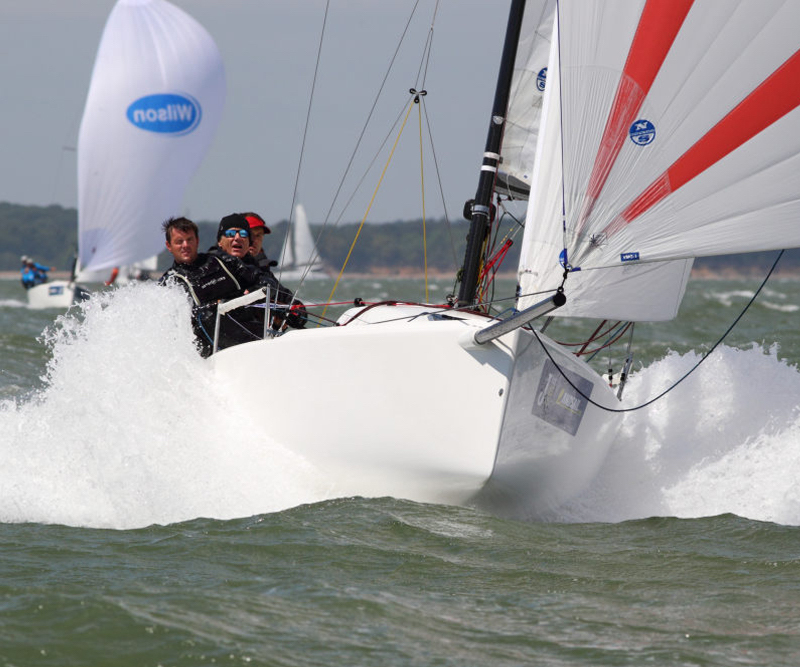 Gavin Howe's Tigris is the 2016 UK National Champion and was also awarded the J-Cup for the best performance at the regatta. Tigris had to hold off a spirited challenge from David Apthorp's J Dream, which finished runner up and also the 2015 champion, Paul Ward's Eat, Sleep, J, Repeat, which claimed third. Paul Ward's team won the penultimate race to get right in the mix but a fifth in the final race had Eat, Sleep, J, Repeat just holding off Dirk van Beek's Sabriel Jnr and Richard Cooper's Jongleur. The competition in the J/88 Class was incredibly close, often with boats overlapped at mark roundings. Stuart Sawyer's Black Dog sealed victory for the J/111 UK National Championship with a race to spare but it was far from easy for the team from Falmouth Cornwall. Marco van Driel's Dutch J/111 Sweeny finished the regatta in second place, with fellow Dutch team, Red Herring skippered by Sjaak Haakman, finishing third. Last year's UK National Champion, Tony Mack's McFly, finished in fourth place. 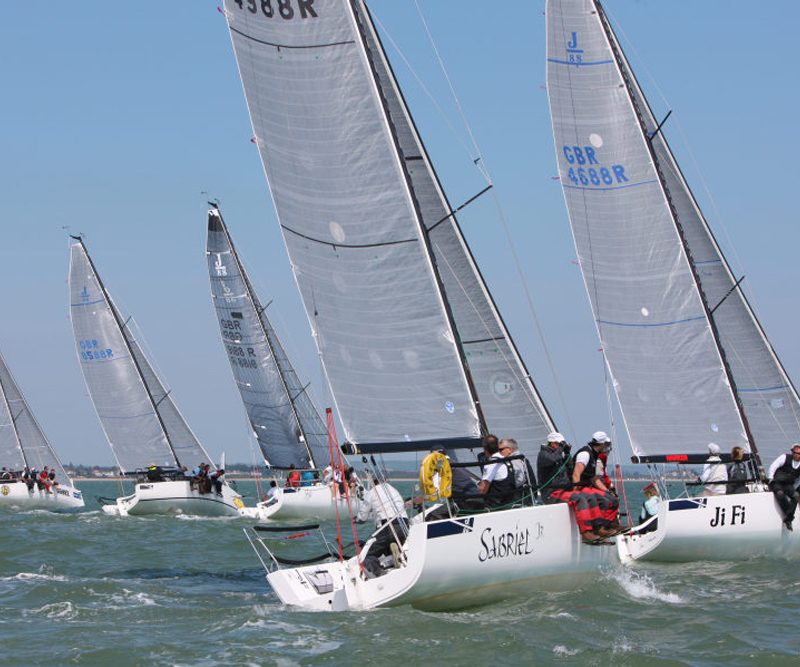 During the three day regatta six out of the eight teams made the podium, including Cornel Riklin's Jitterbug and Chris Jones' Journey Maker II, who both won races. Defending J/97 UK National Champion, Andy Howe's Blackjack II, scored two more bullets today, to dominate the class and retain the championship. Ole Bettum's Almara B III finished the regatta as runner up. Rachel and Robert Hunt's Jumblesail 2, won the battle for third with Richard Sparrow's Only Magic. 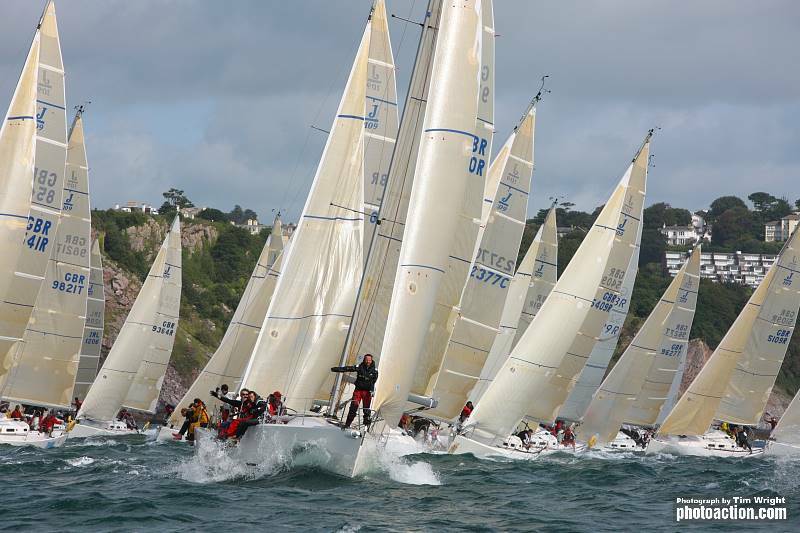 Joe Henry's Jolly Jack Tar finished the regatta with a 2-4 score line to take win the UK National Championship. The team are all serving members of the Royal Navy. Robert Stiles' Diamond Jem was runner up with David Richards' Jumping Jellyfish third. Newcomers to the J/109 fleet, Simon Perry's Jiraffe had an excellent last day winning both races to finish the regatta in style. There were also podium finishes today for Rob Cotterill's Mojo risin', Peter Nicholson's Jubilee and the original J/109, now fifteen years old, Richard Marsden's Judgement Day. With only one race sailed today in the J/70 Class, Jonathan Calascione & Seb Ripard's Harlequin were unbeatable in the 20 strong J/70 fleet. The Maltese-British team, including Royal Southern's 420 world champion Annabel Vose were pushed all the way by Simon Ling's RAF Benevolent Fund Spitfire, the reigning J/70 Corinthian World Champions, whose team include the current J/24 World Champion, Ian Southworth. Charlie Esse's Baby J was third, with a crew including multiple Sportboat world champion and J/70 EuroCup champion, Ruairidh Scott. Congratulations should also go to J/70 teams that made the podium against three notable adversaries; Steve Northmore's Waterjet Precision Cutting, Clive Bush's Darcey, Greg Hall's Valkyrie and Allan Higgs EFS Energy. Didier Le Moal's J/112, J Lance and Craig Latimer's J/92 Wildebeest V had a titanic battle for the class with half a point deciding the winner. J Lance won the penultimate race of the regatta and Robin Stevenson's Upstart was second, heaping pressure on class leader Wildebeest V. J Lance won the last race but Wildebeest V was second, just enough to win the class. J Lance was second with Upstart third. David Greenhalgh's J/92 J'ronimo took finished third in the last race to place fourth. 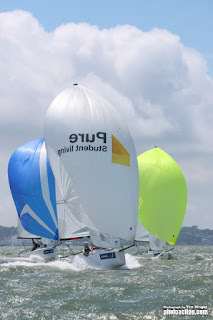 The Landsail Tyres J-Cup was hosted by the Royal Southern Yacht Club, their excellent race team led by PRO Tony Lovell and Dermod O'Malley, provided 45 races in the Eastern Solent, and superb facilities from their waterside club house on the Hamble River. Over 300 owners, sailors and guests enjoyed the Saturday night gala prize giving dinner, held at the Royal Southern Yacht Club with 7 piece band “Groove Instinct” rocking the house. 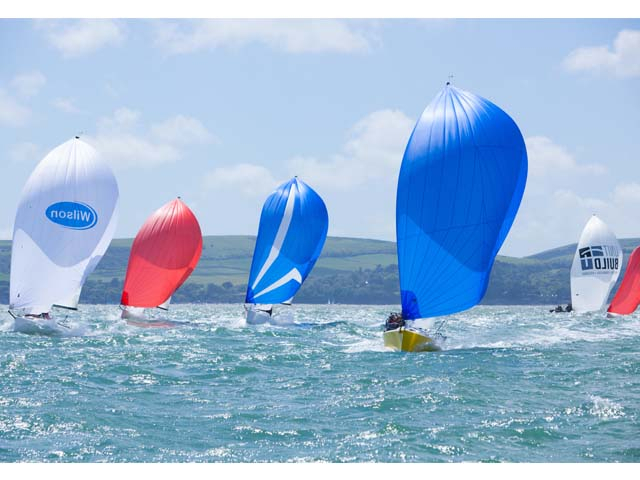 The 2017 J-Cup will be held in Torbay, hosted by the Royal Torbay Yacht Club from the 17-19 August 2017. With five one design classes and a mixed IRC division of asymmetric yachts of similar speed, getting a good start at the Landsail Tyres J-Cup is crucial. The racing amongst the 66 examples of the J Boat design is nothing short of thrilling and spectacular. A stronger gradient breeze, piping up to 16 knots, provided near planing conditions for the light weight flyers. Only two more races are scheduled for tomorrow's final day and favourites for the four UK National titles are emerging. The J/70 Class win looks likely to go to one of two teams and the IRC Class looks like having a Scottish champion. Stuart Sawyer's Black Dog still lead the class after six races but the Cornish team did not win any of today's three races. Marco van Driel's Dutch J/111 Sweeny scored a 4-1-5, to retain second just three points off the lead.Black Dog is the favourite to win the J/111 UK National Championship but Sweeny is snapping at their heels. Gavin Howe's Tigris has opened up a four point lead for the championship, scoring a 2-1-4 today but the results don't tell the full story. After being called back for a premature start in Race 5, Tigris played the shifts extremely well to come back to take the gun. David Apthorp's J Dream scored a 4-3-3 today to retain second place. 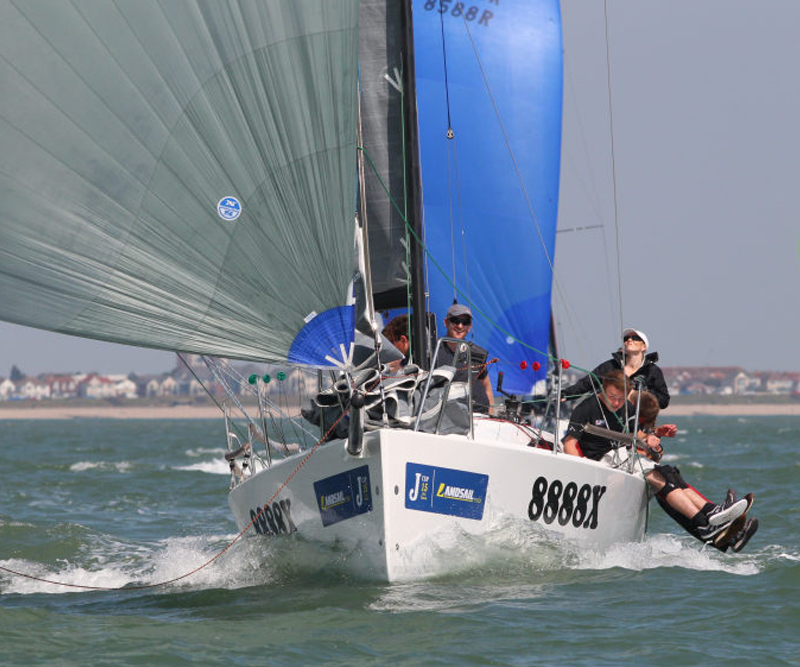 Current J/88 UK National Champion, Paul Ward's Eat, Sleep, J, Repeat, scored two bullets today to move up to third and Richard Cooper's Jongleur recovered from a poor Race 4 to post two second places to move up to fourth. Defending J/97 UK National Champion, Andy Howe's Blackjack II, scored three straight bullets today virtually assuring they retain the UK National Championship. Ole Bettum's Almara B III scored a 4-2-2 to give a cushion for second place. Richard Sparrow's Only Magic and Rachel and Robert Hunt's Jumblesail 2, have a real fight on for third. Both are tied on points but Only Magic is ahead on countback. Joe Henry's Jolly Jack Tar continued their winning ways, taking the gun in the first race of the day but Robert Styles Diamond Jem rolled up their sleeves and fought back to win the last two races, breaking the Navy team's winning streak. David Richard's Jumping Jellyfish scored a 2-3-2 today to move up to third place. 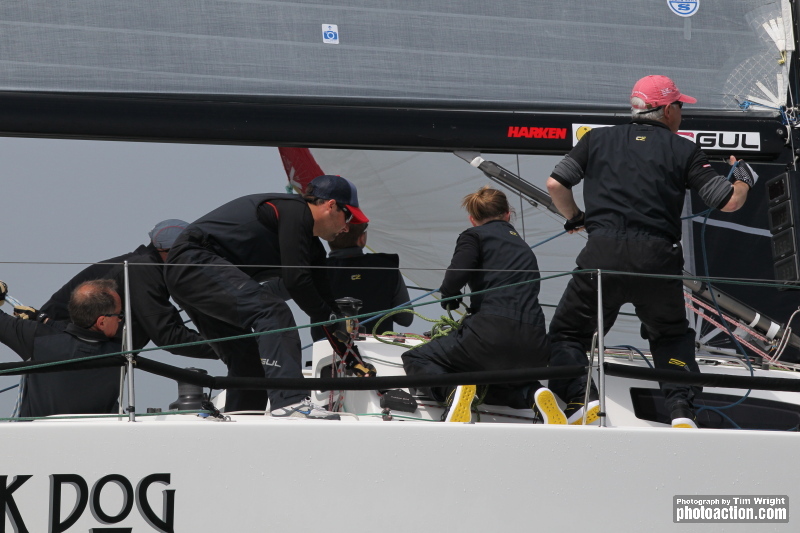 A 1-2-1 score line from Calascione & Ripard's Harlequin in the 20 strong J/70 fleet, puts the team three points ahead of the class with two more races scheduled for the regatta. Team RAF Benevolent Fund Spitfire, skippered by Simon Ling, started the day well to match the class leaders with a 2-1 but a fifth in the final race of the day has left the team with it all to do tomorrow. Charlie Esse's Baby J is winning the battle for third, scoring a 4-4-3 today to open up a big gap on the chasing pack. Craig Latimer's all Scottish team scored a 1-2-1 today to take a up a dominant position in the class but the score board could have been very different. Didier Le Moal's J/112, J Lance was leading the first race of the day but made a navigational error to drop back to 10th for the race. The team bounced back with a win in the next race and was four seconds off winning the last. J Lance did enough to regain second place, just 1.5 points ahead of Robin Stephenson's J/92S Upstart. After racing, the North Sails U Service team delivered a video racing debrief. Led by Frank Gerber with in put from North Sails keel boat expert Dave Lenz and multiple sportsboat world champion, Ruairidh Scott. 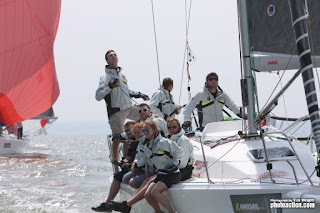 The debrief used areal drone footage supplied by Ollie Mellor and the two professional sailors delivered a master class of expert advice focusing on starts and boat positioning. The Royal Southern Regatta Marquee was a hive of activity with hundreds of sailors enjoying a pint or two and regatta supper. The J-Cup daily was very well attended with prizes donated by regatta sponsors. Racing at the Landsail Tyres J-Cup concludes tomorrow, Saturday 11 June with two races scheduled for all classes. Tickets are still available for Saturday nights gala prizegiving dinner, where a 7 piece band “Groove Instinct” will rock de house! Well over 400 sailors enjoyed a fantastic start to the Landsail Tyres J-Cup in partnership with B&G. Despite a forecast of very light winds, an early morning sea fog burnt off, as an easterly breeze of five knots piped up to over 14 knots with bright sunshine by the end of the day. 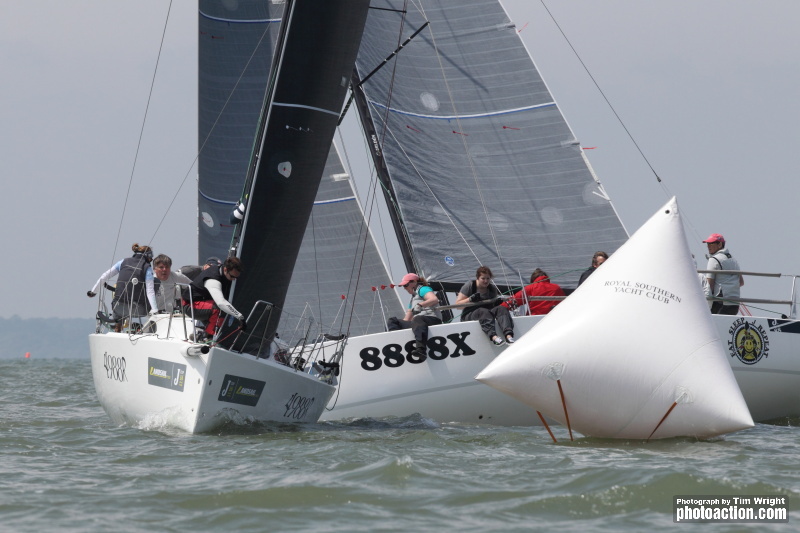 There were three races for all six classes in the Eastern Solent, and with five one design classes and a tight rating band for the IRC Fleet, races were won by seconds with thrilling encounters across the fleet of 66 J-Boats. The eight J/111s enjoyed highly competitive racing on the first day of the regatta, Stuart Sawyer's team from Falmouth, racing Black Dog lead the class, having won two of today's races, just ahead of two Dutch J/111s. Black Dog got off the line well nailing the pin end in the first race of the day, and extended into clear air to take the first race. However in the second race, Black Dog over shot the pin end and turned around to start behind the fleet, but fought back by anticipating a wind shift to take the lead on the last lap. Marco van Driel's Dutch J/111 Sweeny performed well scoring three podium finishes, including a win in the last race to end the day just two points behind Black Dog. 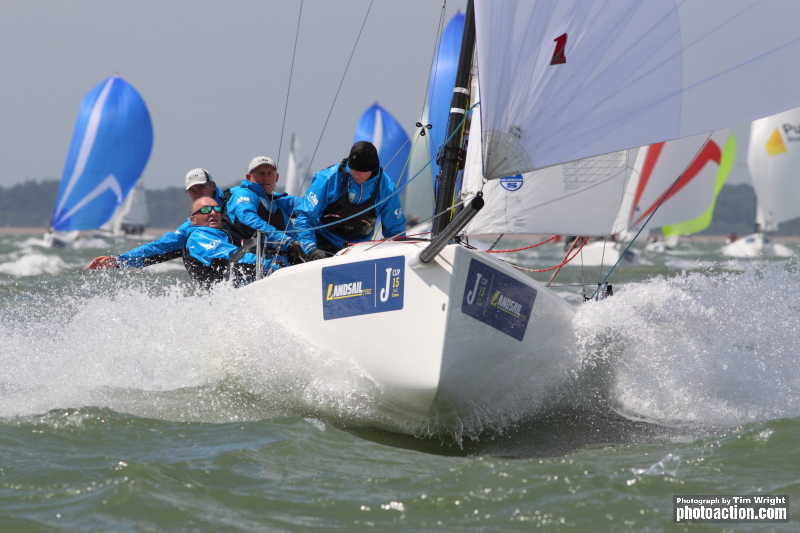 Sjaak Haakman's team racing Red Herring, also from the Netherlands, is third after the first day of racing. Gavin Howe's Tigris and David Apthorp's J Dream had a terrific battle at the front of the J/88 fleet. J Dream won the first race, but after three races, Tigris holds a single point lead having won the last two. Richard Cooper's Jongleur had a consistent day to finish third. 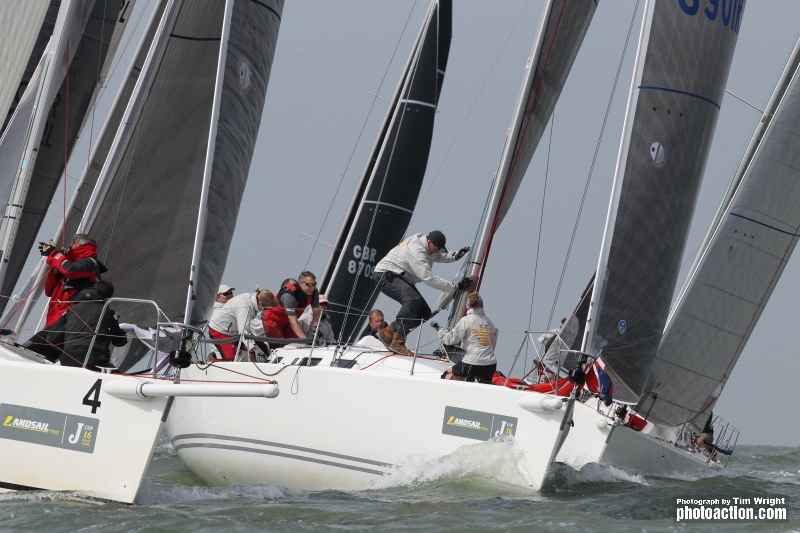 Defending J/97 UK National Champion, Andy Howe's Blackjack II, scored a second and two first today to lead the class. Ole Bettum's Almara B III scored three podium finishes to end the day in second place. Richard Sparrow started the day with a race win, and ended the day in third place, just a point ahead of Rachel and Robert Hunt's Jumblesail 2. Joe Henry's Jolly Jack Tar lead the class after a polished performance in today's three races. Scoring three wins to dominate the first day. Robert Styles Diamond Jem scored well in every race, to take second after the first day's racing. Peter Nicholson's Jubilee finished the day in third. In the 20 strong J/70 fleet, two teams dominated the first day of racing. Calascione & Ripard's Harlequin lead the class by virtue of a 2-2-1 score line, but the Maltese/British team was pushed all the way by Team RAF Benevolent Fund Spitfire. Led by skipper Simon Ling, the team won the first two races today, but placed fifth in the final race to finish the day second in the class. A mixed fleet of 12 J Boats competed under the IRC Rating System, to produce incredibly close results. Craig Latimer's Scottish team racing J/92 Wildebeest top the leader board after three races but only just. The first race set the standard with Wildebeest tying after time correction with last year's J-Cup winners, Robin Stephenson's J/92S Upstart. Robin's team finished the day just a point behind Wildebeest. 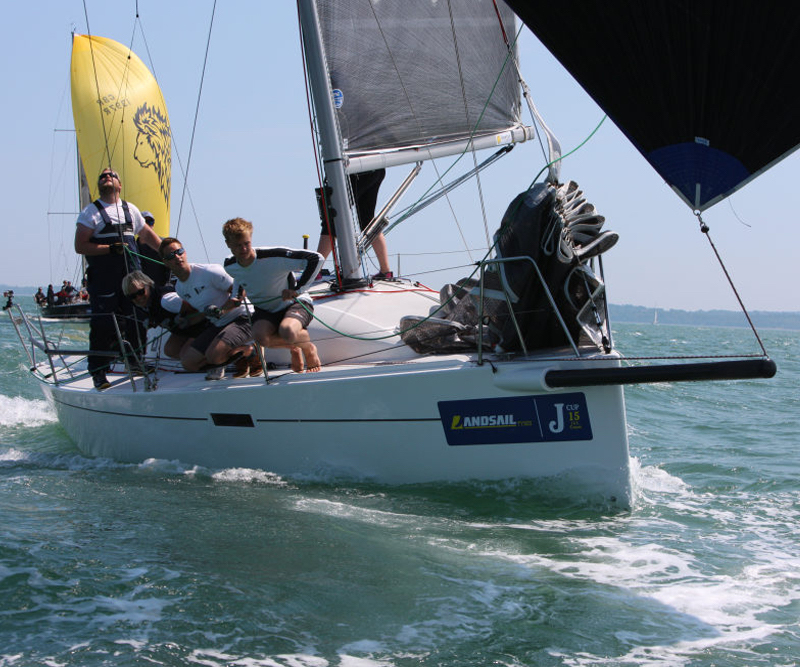 Making their UK racing debut, J/112E J Lance, skippered by Didier Le Moal scored a 4-2-1, placing third, only half a point behind Upstart. After racing, the North Sails U Service team delivered a video racing debrief. Led by Frank Gerber with in put from One Design specialist, Jeremy Smart, and expert keel boat exponent, Dave Lenz. 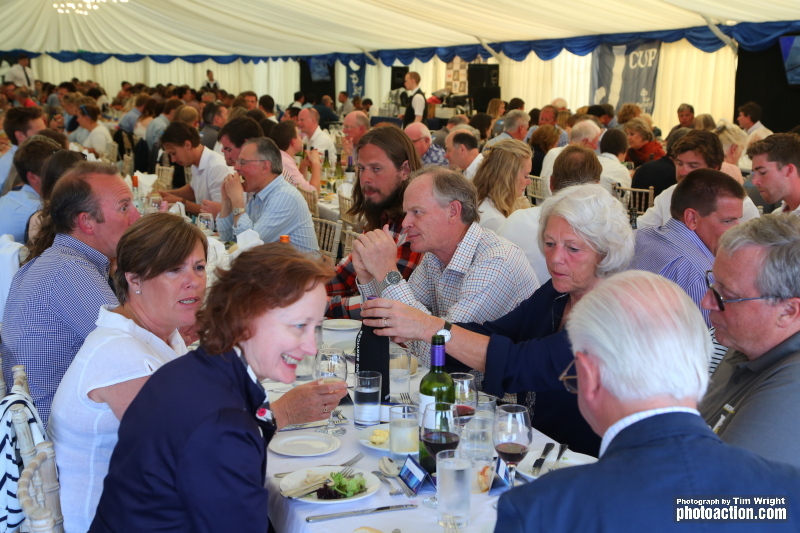 The Royal Southern Regatta Marquee was buzzing with stories of today's racing prior to the J-Cup daily prize giving and sailors' supper. Racing continues tomorrow, Friday 10 June with three races scheduled for all classes. Over 60 yachts are expected for The Landsail Tyres J-Cup in Partnership with B&G, exclusively for racing yachts of the J Boats brand, and this year will incorporate a record four UK National Championships for the J/88, J/97, J/109 and J/111. Besides the four National Championships, an impressive fleet of J/70 Sportsboats will be racing, as well as other J Boats racing under the IRC Rating system. 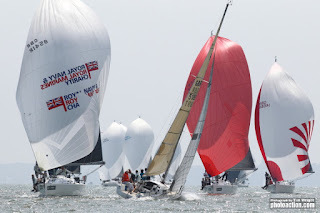 Three days of exciting and highly competitive racing will be complimented by lively shoreside entertainment at the newly constructed Royal Southern Yacht Club’s Prince Philip Yacht Haven. The superb facility will be home to The Landsail Tyres J-Cup for the regatta, with well over 400 sailors enjoying the hospitality of the famous club on the River Hamble. Marco van Driel's Dutch team racing Sweeny will be racing with the top British J/111s including the current UK National Champion, Tony Mack's McFly. Last year's runner up, Martin Dent's JElvis is as strong as ever and Stuart Sawyer's Black Dog, the winner of a hotly contested Vice Admiral's Cup, is also in great form. 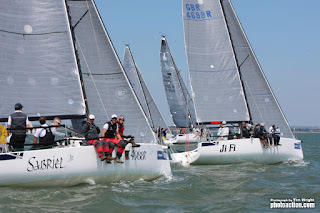 Cornel Riklin's J/111 Jitterbug was second only on countback to Black Dog in this year's Vice Admiral's Cup and has been part of the J/111 fleet for several years. 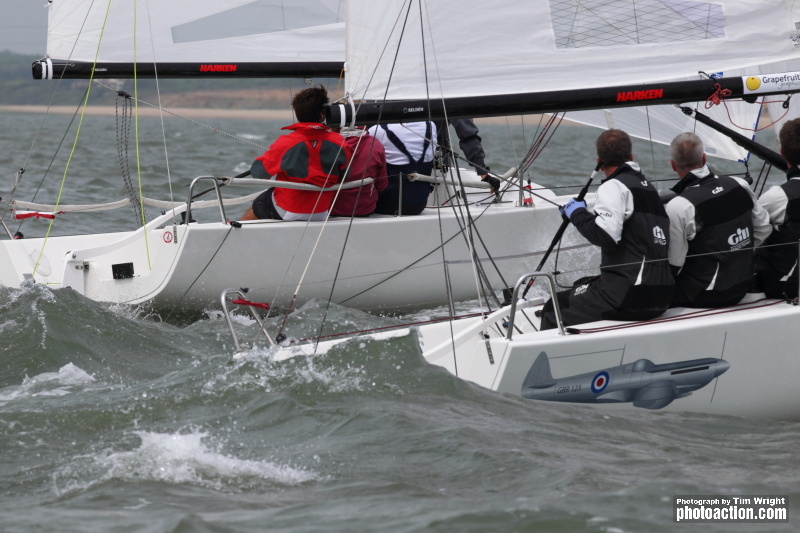 The J/88 Class will be competing for their UK National Championship. Last year's winner of the inaugural event, Paul Ward's Eat, Sleep, J, Repeat is back to defend the title. 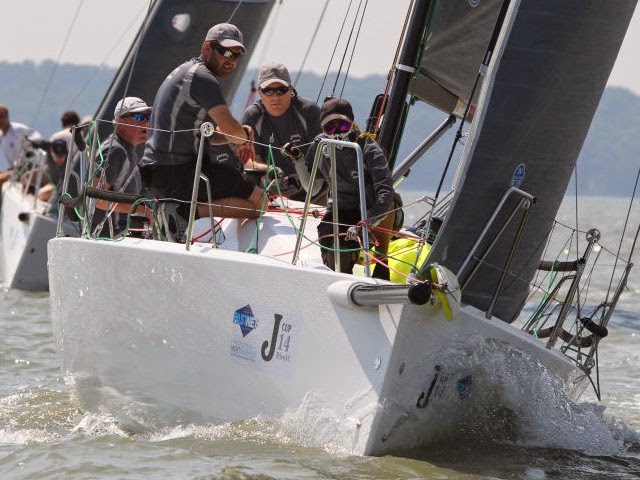 The J/109 fleet is also set to have a significant number of teams racing for their National Championship with eleven boats among the early entries, including Vice Admiral's Cup winner, Diamond Jem, skippered by Robert Stiles. 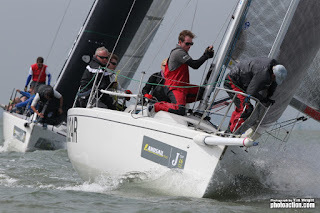 Competing at The Landsail Tyres J-Cup in the J/109 Class, for the second time, will be Simon Perry's Jiraffe. 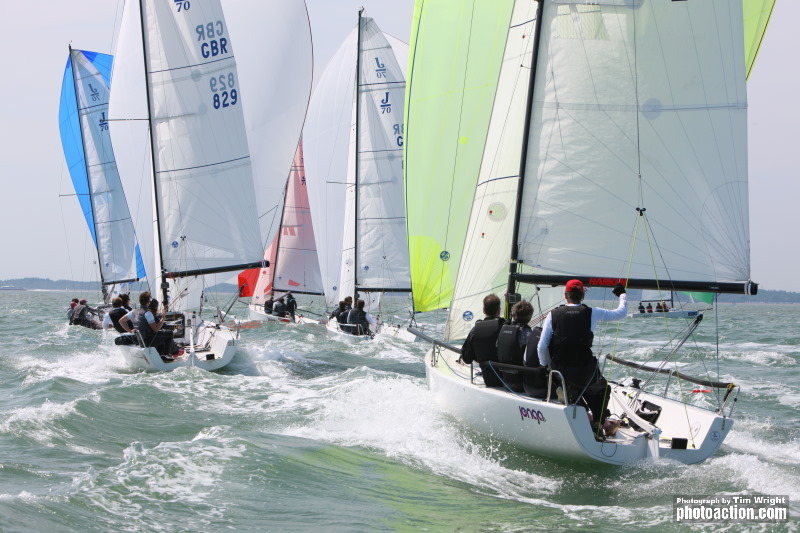 The J/97 National Championship provides the opportunity for J/97 owners to gather from all over the UK. Andy Howes' Blackjack II will be defending their championship win from last year. With a significant number of teams from the Royal Yacht Squadron and the Royal Thames, a bumper fleet of over 20 J/70 Sportsboats is expected for The Landsail Tyres J-Cup. It is an integral part of the UK J/70 calendar. Discounted berthing at the Royal Southern Yacht Club for the 2016 Landsail Tyres J-Cup in partnership with B&G! We're thrilled to let you know that we are now in a position to offer J-Cup competitors discounted berthing at the Royal Southern Yacht Club for the duration of the regatta! The reduced rate is £1.75/m per night (down from £3.70/m for visitors). This reduced fee is partially funded by the club and by Key Yachting. 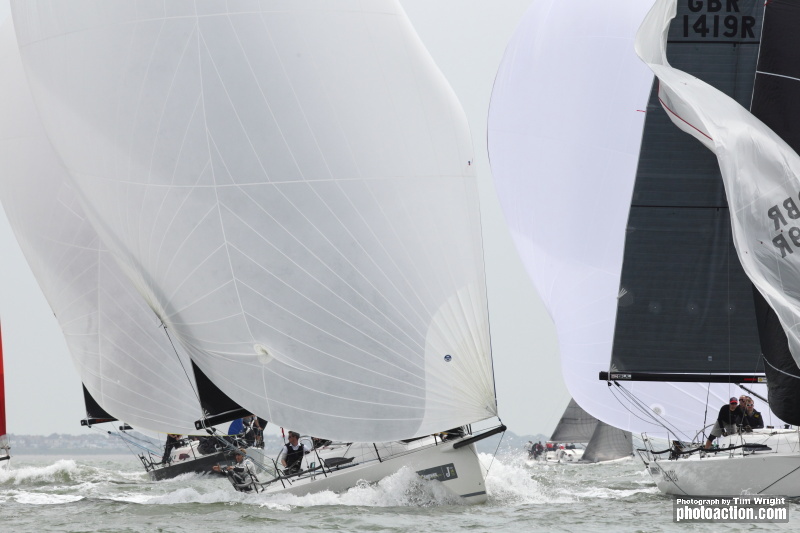 The final day of the 2015 Landsail Tyres J-Cup in partnership with B&G was nothing short of spectacular. With 20 knots, gusting 25 out of the southwest, the race course was festooned with J-Boats surfing downwind in a full on foam up. 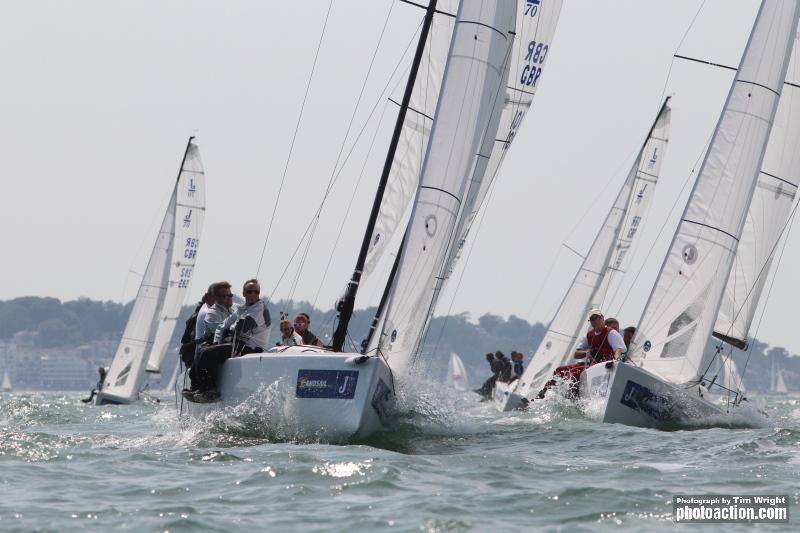 There were thrills and spills right across the 67 J-Boat Fleet in the big conditions. Boat handling was at a premium and today's high performers harnessed the breeze, staying under control downwind and upwind hiking the boat flat and keeping good sail trim. In IRC B Robin Stevenson from Brighton, racing J/92, Upstart had a perfect score for the regatta, winning all four races. Robin Stevenson's Upstart was the only team to score a perfect result and was awarded the J-Cup for their performance. 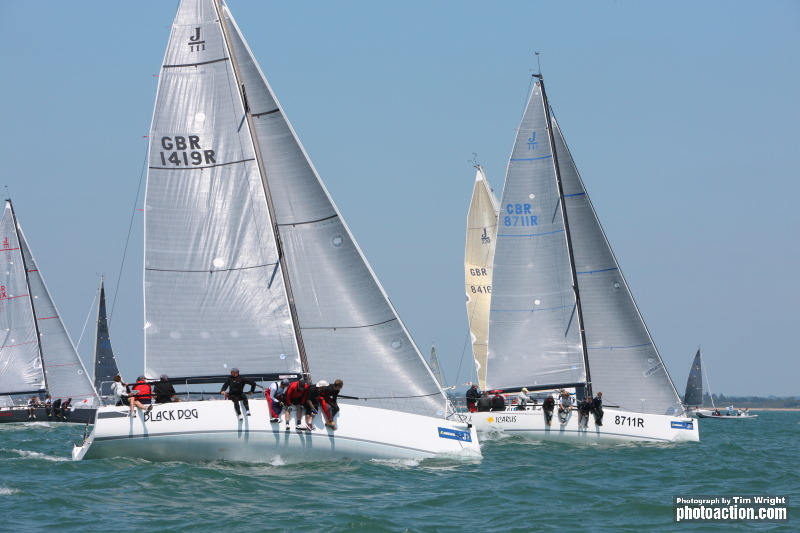 In the J/92 Class, David Greenhalgh's Hamble based J/92, J'ronimo made the podium in every race to claim second place and Robert Salter's J/92, Jackdaw was third. 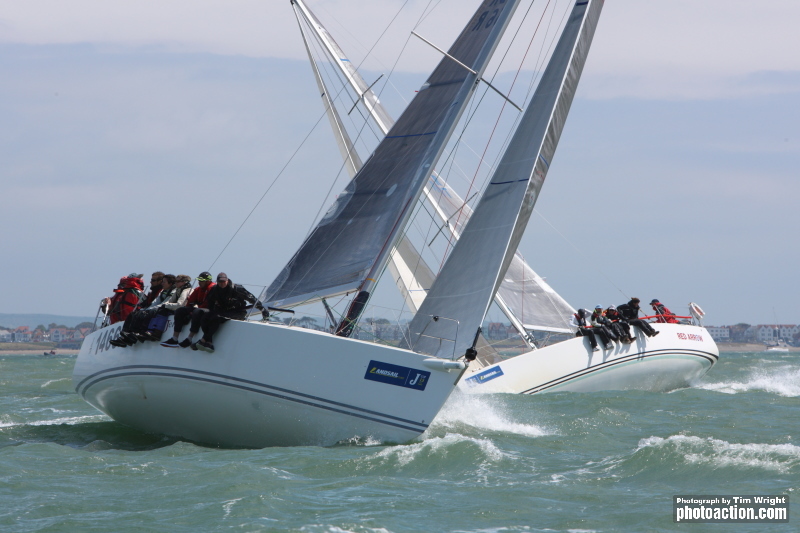 Top performing J/80 was Rachel Hunt's Hamble based Jumblesail. 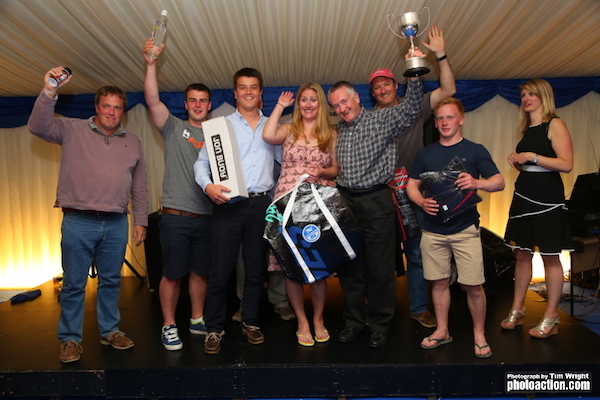 Stuart Sawyer's Cornish team racing J/111 Black Dog was the winner of IRC A and the J/111 Class with Londoner Chris Body racing J/111 Icarus in second place with five podium finishes for the regatta. Cornell Riklin Lymington based J/111, Jitterbug was third. 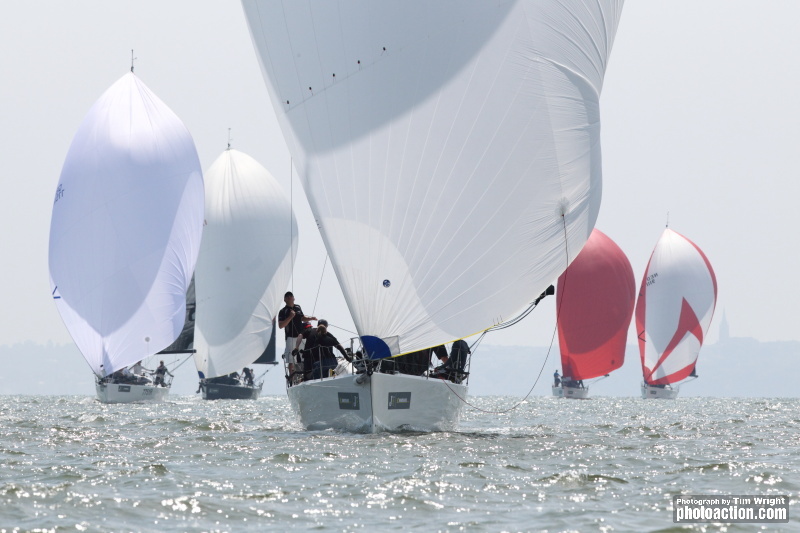 In the Lifedge J/109 National Championship, 17 J/109s had an intense battle with Ian Nagle's Royal Cork YC team, racing Jelly Baby, taking the crown for the open event. Tony Dickin's Hamble based J/109, Jubilee scored a first and a second today and a dramatic tie with Joe Henry's Jolly Jack Tar to claim second for the championship. 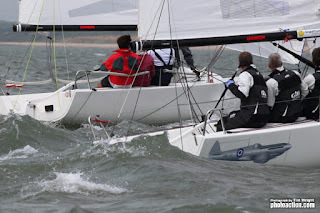 Alan Bennett's Dorset team racing J/109 Blue Jay of Poole was third for the regatta. In the J/70 class Geoff Carveth from Warsash, helming Gill Race Team, was fully launched in the fast conditions, producing text book starts, power upwind and scorching speed off the breeze, Gill Race Team scored six bullets for the regatta to win by a hansom margin. Jamie Holmes' J/70, Jika had a great last day on the water, blotting Gill Race Team's perfect score line, winning the penultimate race of the regatta. Patrick Liardet's J/70, Cosmic, based in Hamble, had a consistent series to claim third place and the Corinthian prize for an all amateur crew. Ian Wilson, owner of Gill Race Team spoke about the experience. Paul Ward from Itchenor, racing J/88 Eat, Sleep, J, Repeat won two of today's races to win the inaugural J/88 National Championship. Stewart Hawthorn's J/88 Ji Fi scored six podium finishes for the series to place second, just a point ahead of David Apthorp's J/88 J-Dream. 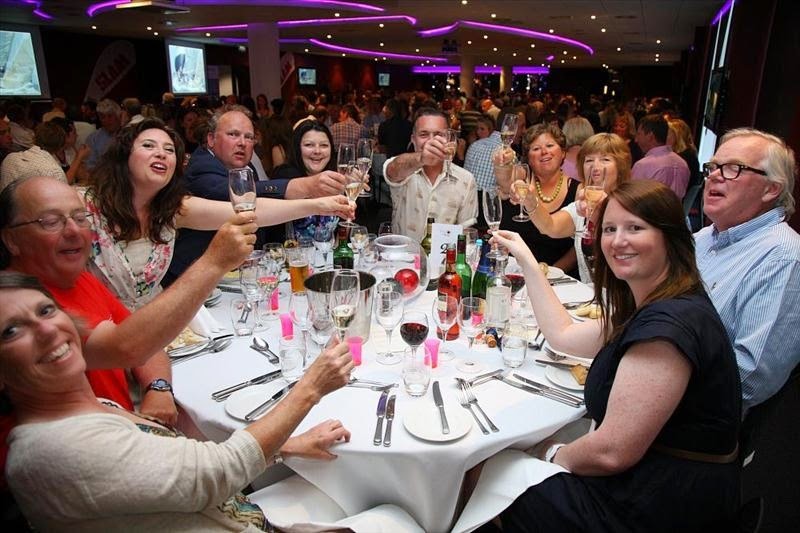 After racing competitors at the Landsail Tyres J-Cup enjoyed a Gala Awards Ceremony with supper at the Cowes Yacht Haven Events Centre. Well over 300 party revellers danced the night away to live music late into the evening. 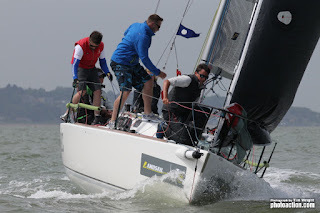 The Solent weather refused to play ball and racing for Day Two at the Landsail Tyres J-Cup in partnership with B&G. Lack of wind forced the race committee to abandon racing at 3 p.m. but the day was not wasted. 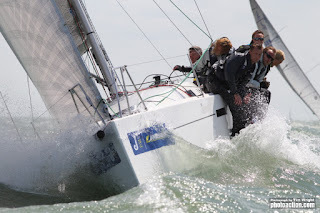 Competitors remained ashore and there was good banter in Cowes Yacht Haven and the Island Sailing Club. During the afternoon, competitors gathered in the Lower Marquee at the Island Sailing Club for the North ‘U’ fully Interactive briefing at the Island Sailing Club. 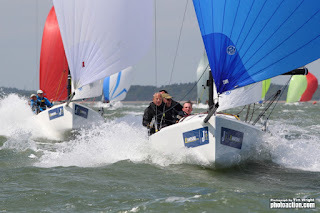 Presented by Frank Gerber and Ed Hill, and assisted by Jeremy Robinson and Kelvin Matthews, competitors at the Landsail Tyres J-Cup were played videos of action from Day One of the regatta, with analysis of tips and tricks designed to improve performance in areas such as starts, sail trim and boat handling. Racing at the Landsail Tyres J-Cup in partnership with B&G will continue tomorrow, Saturday 13th June, with an earlier start of 09:30. 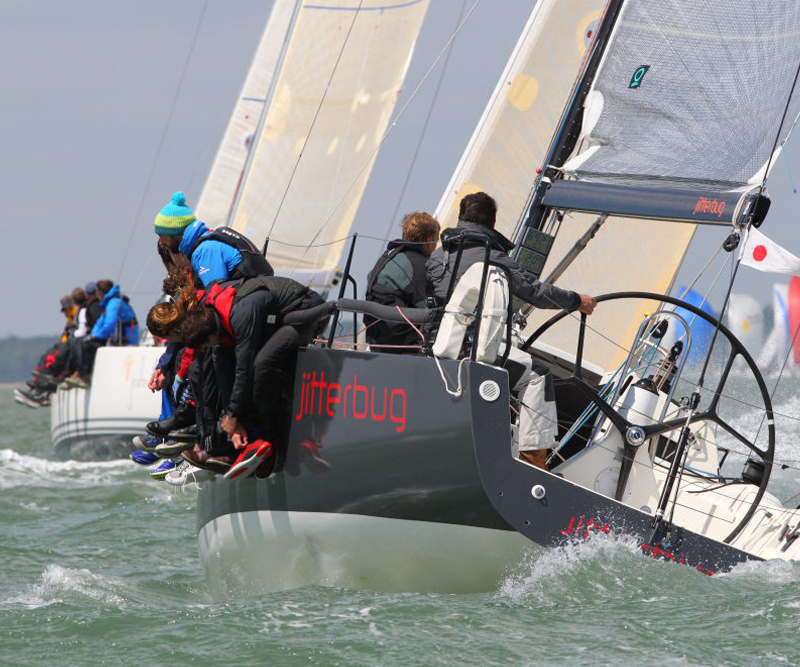 The central Solent delivered spectacular racing conditions for the first day of the Landsail Tyres J-Cup in partnership with B&G. An easterly to south easterly breeze, oscillating 20 degrees during the day, kept the sailors racing the 67-J Boat fleet on their toes. Warm sunshine and a solid breeze of fifteen knots had the high performance J-Boats surfing at double digit boat speeds. Smart starts and getting the right side of the tide and the shifts were the key to success, as well as downwind boat speed and slick mark roundings. Three teams remain unbeaten after the first day of racing at the Landsail Tyres J-Cup. Robin Stevenson's J/92, Upstart was in impressive form winning all three of today's races and Ian Nagle's Royal Cork YC team, racing Jelly Baby tops the leader board for the Lifedge J/109 National Championship. Geoff Carveth's Gill Racing Team is unbeaten in the high performance J/70 Class. The inaugural J/88 National Championship got off to a highly competitive start with three different teams winning today's races. Stewart Hawthorn's Ji Fi won the first race by 26 seconds. Paul Ward's Eat, Sleep, J, Repeat won the second race by just 10 seconds and David Apthorp's J-Dream won the last race of the day by just 6 seconds. Eat, Sleep, J, Repeat lead the J/88 National Championship by a single point after three races. 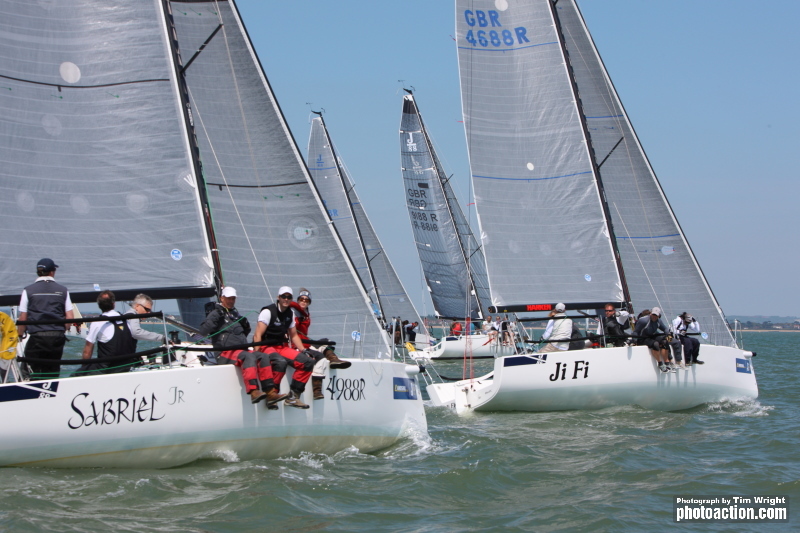 In the J/70 Class, Geoff Carveth's Gill Racing Team stamped their authority on the 19-strong fleet, winning all three of today's races but it was far from easy for the multiple dingy racing champion. 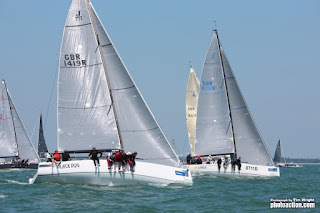 Gill Racing Team won the first race of the regatta by just four seconds from Nigel Evans' Little Louise and the second race by a single second from Simon Cavey's Just4Play. In the J/97 National Championship sponsored by Fastnet Marine Insurance Richard Sparrow's Only Magic leads by virtue of a winning the last race of the day. 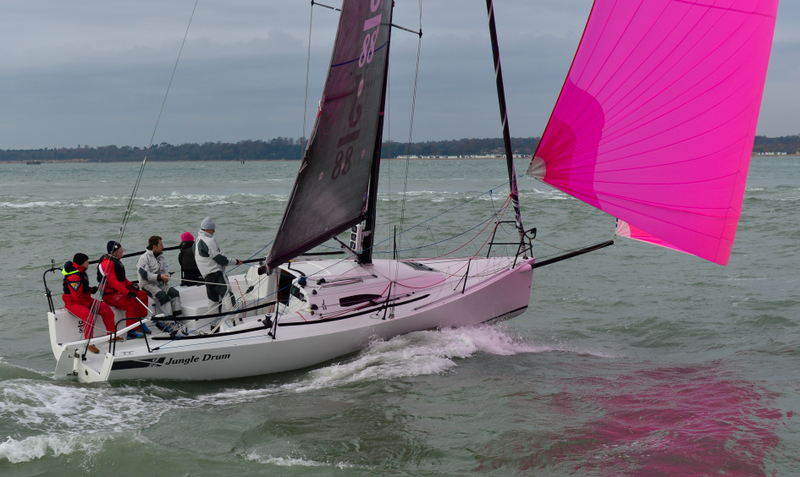 However, Andy Howe's Blackjack II is on equal points after two races with Helen Hofmann's Jaslan in third. Top of the leader board for the J/111 fleet is Stuart Sawyer's Blackdog, having scored a first and a second in today's races. Cornel Riklin's Jitterbug won the first race of the day and scored a third in the last, securing second place with Chris Body's Icarus scoring two podium finishes claiming third just a point behind Jitterbug. After racing Stuart Sawyer's cornishmen racing Black Dog was the first team to the Island Sailing Club bar, triggering happy hour, and the North Sails fully Interactive race debrief at the Island Sailing Club was well received. A lively daily prize giving was held at the club prior to a Curry Supper in the Lowe Marquee. 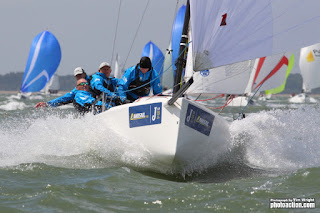 Racing at the Landsail Tyres J-Cup in partnership with B&G continues tomorrow. 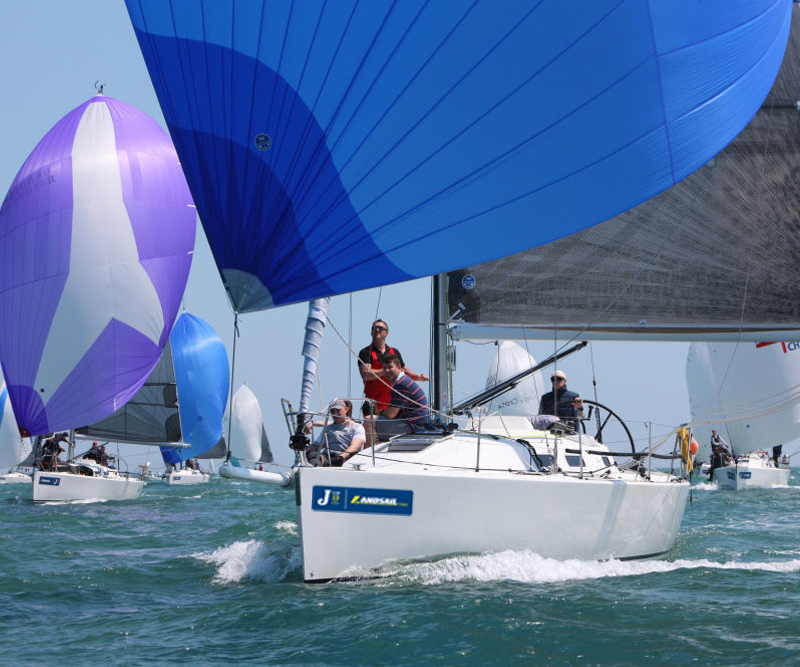 Big breeze is expected in the Solent over the weekend, providing high octane conditions for a bumper fleet of 67 yachts entered for Landsail Tyres J-Cup. 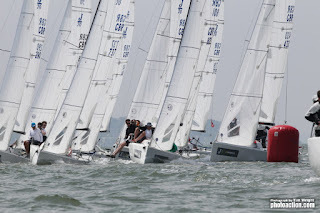 Registration for the 15th edition of the J-Cup opened Wednesday 10th June with three days of electric racing on tight Solent courses scheduled. The Island Sailing Club is a hive of activity with competitors enjoying a welcome BBQ and plenty of banter about the regatta. Spectacular conditions are expected for the first day with a strong easterly breeze expected to provide exhilarating racing. The vast majority of the fleet will be racing in one design classes, including a 19-strong fleet of powerful J/70s. The fastest growing sportsboat class in the world, will revel in the fresh breeze. The new J/88 fleet will enjoy their first National Championship, sponsored by Fastnet Marine Insurance, eight one-design family speedster will do battle for the title. The J/97 National Championship will also be held during the regatta and sixteen J/109s will be racing for the Lifedge J/109 National Championship and the high performance, turbo-charged, J/111 fleet will enjoy electric racing in the feisty conditions. The Landsail Tyres J-Cup kicks off on June 11 with over 50 examples of the J-Boat range competing on tight Solent courses over three days. Thrilling action is expected with the added attraction of three individual national championships up for grabs. 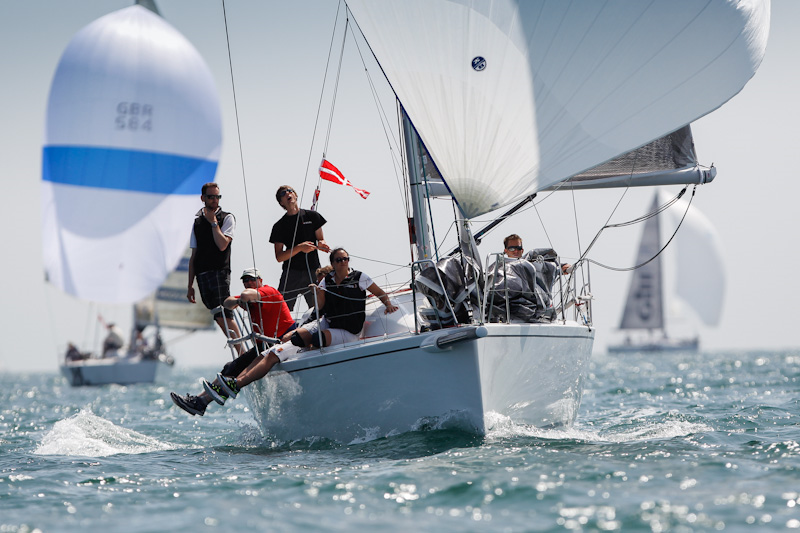 Hosted by the Island Sailing Club, the 15th edition of the J-Cup will deliver one-design racing at its best, with a party atmosphere ashore in Cowes. 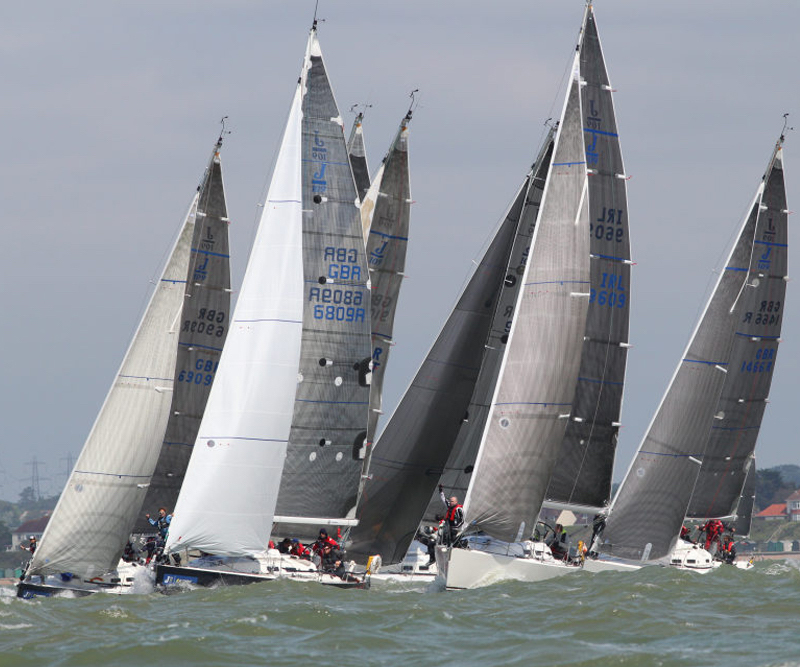 The largest fleet of J/70s assembled in the UK is expected to enjoy a thrilling encounter. With a whopping 800 J/70s sold in in the first three years, the fast planing sports boat has taken the sailing world by storm, high octane action is expected. 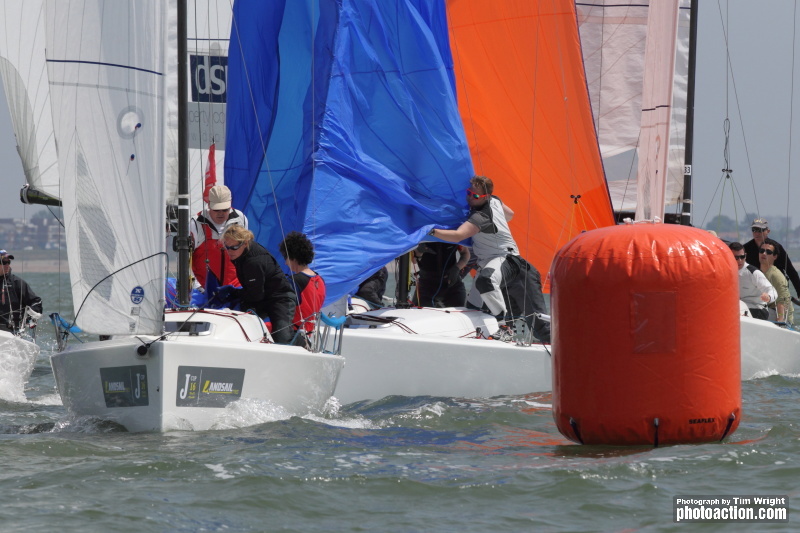 The ever popular J/109 fleet will be racing for the Lifedge J/109 National Championship. 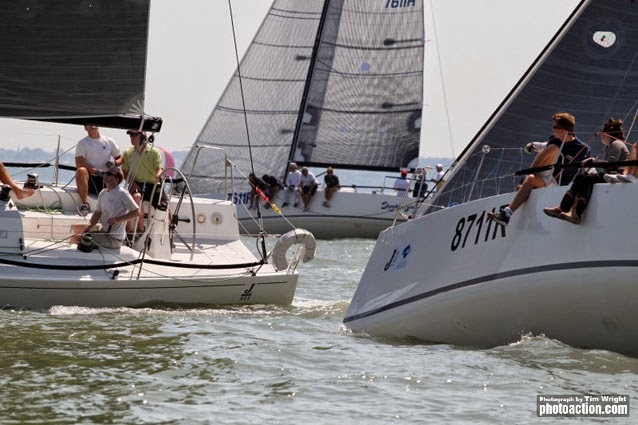 Racing in the strict one-design cruiser/racer class is always close with previous national champions being decided by the narrowest of margins. The rapid expansion of the new J/88 fleet means they will enjoy their first National Championship sponsored by Fastnet Marine Insurance at the Landsail Tyres J-Cup and the J/97 National Championship will also be contested over the weekend. J-Cup Sailors Could Win America's Cup Tickets! 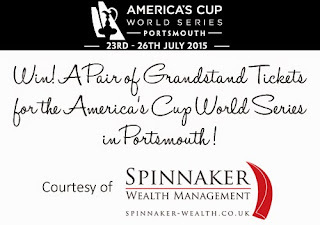 Supporting J-Cup for the second year in a row are financial planning experts Spinnaker Wealth Management, who will be running a prize draw for two pairs of Grandstand tickets for the Sunday of the America's Cup World Series in Portsmouth! The event will deliver an incredible opportunity to watch world class AC45 racing with plenty of entertainment ashore. Principal of Spinnaker Wealth Management, Nigel Evans, (who is racing at J-Cup on J/70 Little Louise!) will be pleased to speak to competitors about the services offered by the company. Nigel commented; "This is a golden opportunity to shore up your financial planning with a certified wealth management specialist. Quality financial planning is of ever-increasing significance now as pension regulation has recently received the biggest overhaul in decades. For businesses, Auto Enrolment is placing additional pressures on employers and the new pension freedoms mean advice has become vital for a secure retirement." Spinnaker Wealth Management invite you contact them via their website, www.spinnaker-wealth.co.uk or by calling 01273 857730. Prize draw cards will be distributed at the J-Cup prizegiving dinner, with winners announced the same evening. Best of luck! The J-Cup organisers are thrilled to announce that Italian clothing brand SLAM will once again support the annual UK J Boats regatta. Selected by many of the world's top sailors and competitive racing teams, and a firm favourite with J Boats sailors, SLAM pride themselves on designing sailing gear that not only protects against the worst of the weather but, at the same time, allows for maximum comfort and freedom of movement. The 2015 edition of the infamous J-Cup will, for the first time, be hosted by the Island Sailing Club in Cowes from 11-13 June. Handily for J-Cup competitors, SLAM's flagship store is located in the heart of Cowes, and the team there will be pleased to welcome sailors throughout the duration of the regatta. Store manager Elena Antoniazzi said "We are honoured to support the J-Cup event, and we are excited to welcome competitors into the store to take advantage of special discounts on their regatta orders. 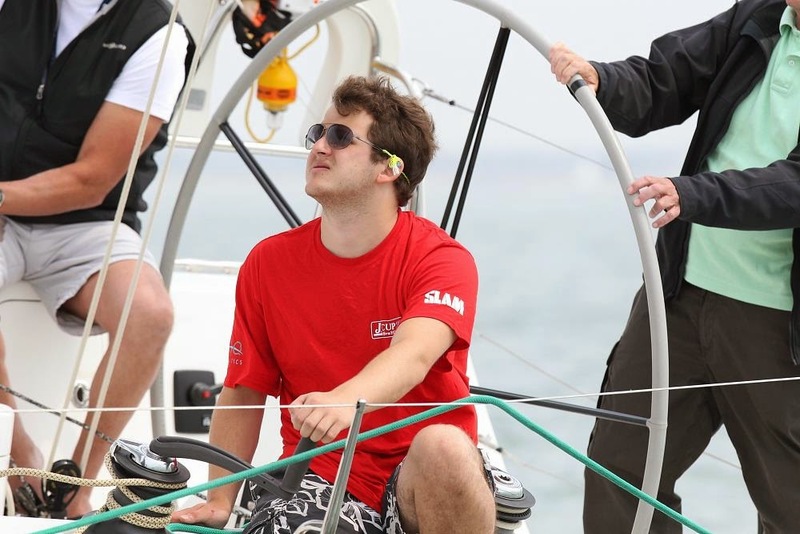 We specialise in sailing teamwear and provide a very fast, competitive, and high quality embroidery service to our customers." SLAM’s flagship store are working on a new website due to launch in April www.slam-cowes.co.uk. In the meantime sailors can browse the full collection at www.slam.com. 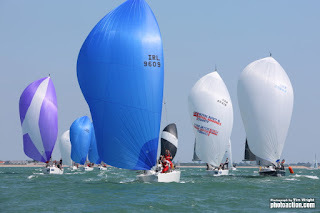 The rapid expansion of the new J/88 fleet means they will enjoy their first National Championships at the Landsail Tyres J-Cup in Partnership with B&G, hosted by the Island Sailing Club in Cowes from 11th – 13th June 2015. The J/88 is the latest addition to J Boats’ sport range. Designed to be versatile and easy to handle, she is also a sleek and super quick combination of sail power and stability, with a huge social cockpit, push button diesel engine, below-decks head, deck-stepped carbon mast, single-point lift and much more. 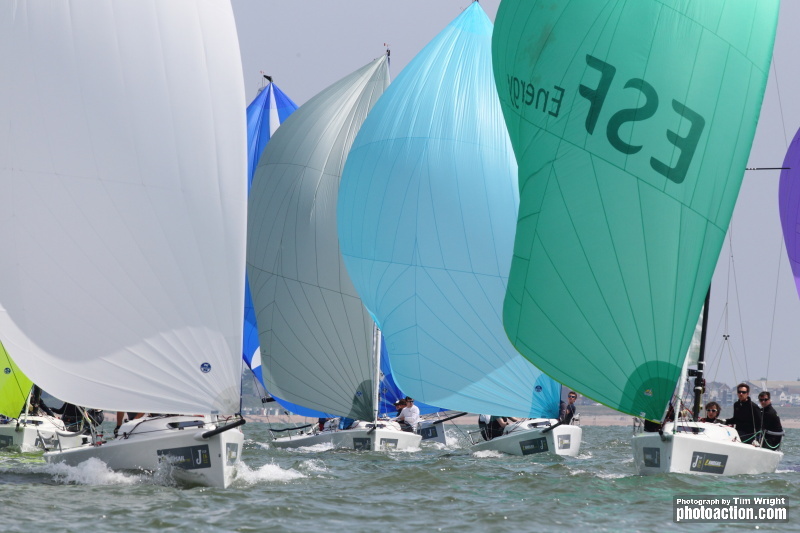 The fifteenth edition of the J-Cup will also incorporate the National Championships for the J/97 and J/109. 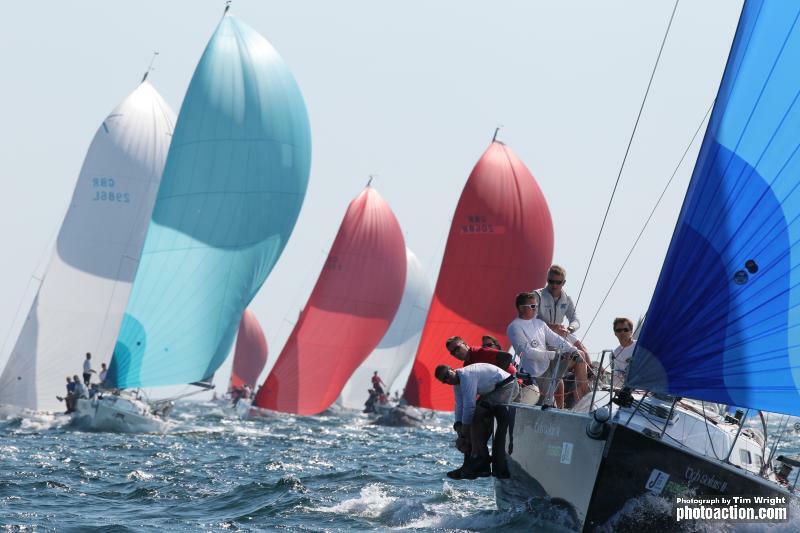 One of the few regattas which has seen steady or increased entry numbers in recent years, the J-Cup is exclusively for yachts of the J Boats brand, and entails three days of racing coupled with lively socials. The unrivaled spirit of the regatta is largely credited to the close-knit community of owners who enjoy long relationships with their boats. Entry for the regatta is now open via www.islandsc.org.uk/racing, where competitors can also download the Notice of Race. Cowes to host its first J-Cup in 2015! 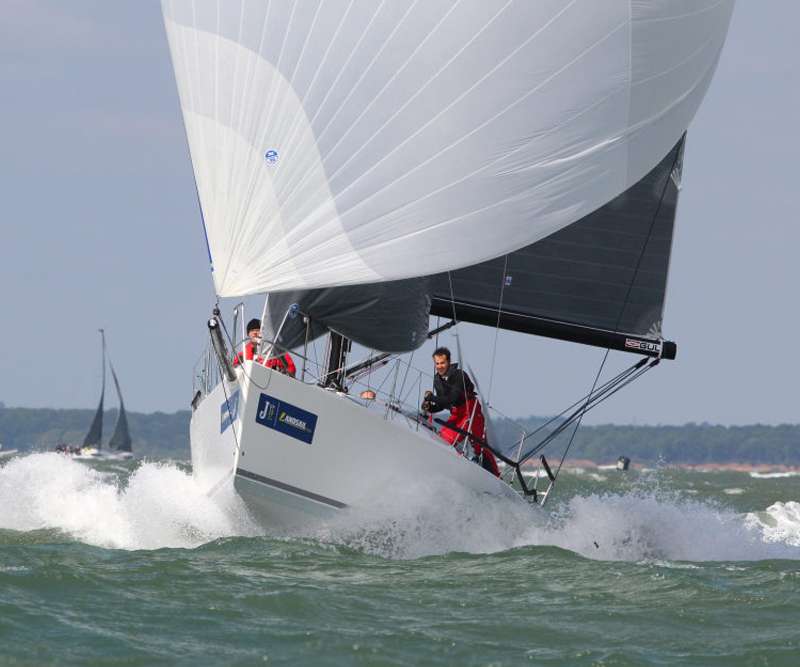 The annual regatta exclusively for J Boats will head to Cowes in 2015 for the first time in the event’s history. The Landsail Tyres J-Cup will be hosted by the Island Sailing Club, with racing from 11th–13th June. The J-Cup has attracted strong entry numbers since the very first regatta in 2000. Organisers Key Yachting attribute this to their legion of very dedicated and passionate owners, 65 of which entered the 2014 event.The largest class at the J-Cup is usually the vivacious J/109 fleet, with one design racing also on offer for the J/70s, J/80s, J/97s and J/111s. It is expected that the inaugural National Championships for the new J/88 class will be held as part of the Landsail Tyres J-Cup 2015. 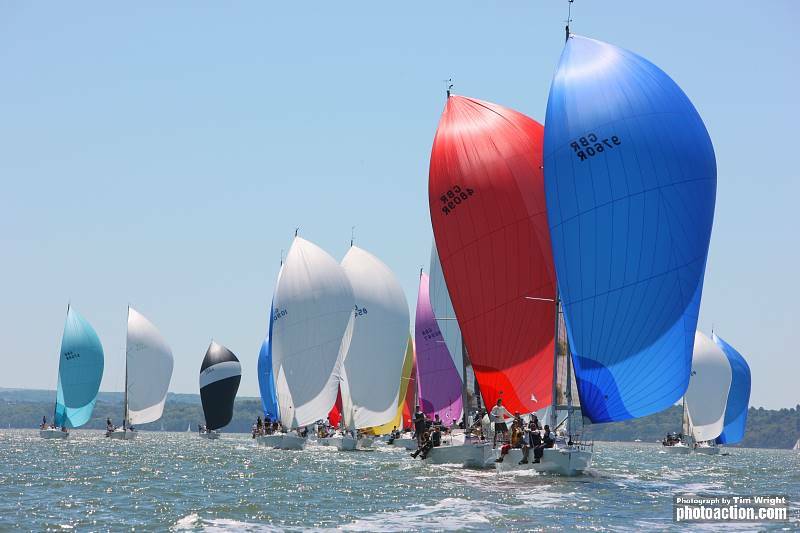 The timing of the event, two weeks prior to the Round the Island Race, will allow boats that have travelled long distances to compete in two stellar events.Teams can expect up to eight races across the three days, with music and entertainment planned for the evenings. 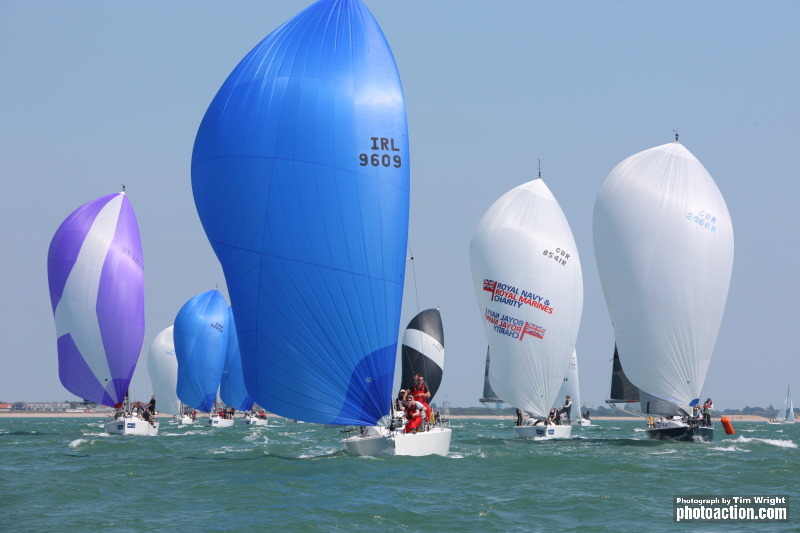 As is customary at the J-Cup the final prizegiving will give the organisers an excuse to throw the 400 or so competitors a fabulous party with live music, against the backdrop of the infectious atmosphere of Cowes. All Rights Reserved by Key Yachting Ltd. Simple theme. Powered by Blogger.